New players at VIKS.com registering through BetAndSkill are eligible for an exclusive welcome bonus of 20 free spins on Starburst slot with no deposit required, plus the regular bonus of 100% bonus up to £500 (or currency equivalent) as well as 50 extra Free Spins on the all-time favourite game Starburst. But you can get an exclusive Welcome Package VIKS Casino that includes a 100% bonus up to £500 on your first deposit and 50 Free Spins on the all-time favourite video slot Starburst! There's no bonus code to enter in order to get your 20 no deposit free spins! 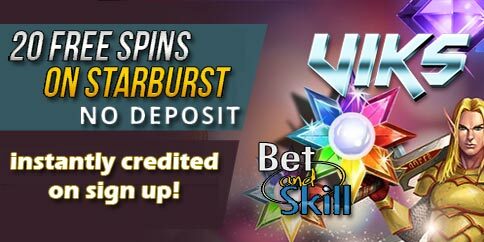 Just join VIKS Casino through this page and you will find the 20 Starburst free spins automatically and instantly credited into your account! * The 20 free spins on registration are only for UK, Sweden, Finland, Norway and Germany located players. Find below how to claim your bonus! 2. Open a new account with VIKS Casino via this special link. It only takes two minutes! 3. Don't make use of any bonus code! Your 20 free spins have been instantly credited! 4. Enjoy the popular online slot Starburst! 5. Ready to make your first deposit? Use the bonus code Bonus Code: V500U and get a fantastic 100% up to £500 as well as 50 extra Starburst Free Spins! Viks has a large selection of online casino games from the popular NetEnt, Microgaming, Play N’Go, NYX Games, Edict and Evolution Gaming software houses, with a huge collection of video slots, classic casino games, Video Poker and live tables available! Only United Kingdom, Sweden, Finland, Norway and Germany located players are eligible for the 20 no deposit free spins offer. A player that never made a successful deposit prior to winning will only be allowed a maximum withdrawal of one hundred Euro (€100) in total, regardless of the total amount won. The remaining balance will be forfeited. Bonus is limited to one per user, IP address, computer device, family, residential address, telephone number, credit or debit card and/or e-payment account, email address and environments where computers are shared (schools, workplaces, libraries, etc.) during a promotional period unless otherwise stated. Maximum bet when a bonus is pending, or actively being turned over is €5 ($5, £5 or equivalent in any other currency). Failure to follow this condition may result in forfeiting any winnings. Wagering requirements for Non Deposit Bonus are 35 times the bonus amount, unless stated otherwise on the promotion in which the bonus was earned. Wagering requirements can be met by playing on slots only. ‘Playing for fun’ on any game does not count towards any wagering (turnover) requirement there may be. All winnings are considered to be bonus money and will be converted to real money only after the initial bonus wagering requirements are met unless stated otherwise in the promotional terms and conditions. Unless stated otherwise, Bonus are only valid for 7 days once received. VIKS.com may, at its sole discretion, change the terms and conditions, or limit the eligibility of players to participate in this promotion, for any reason whatsoever without prior notice to the end users. Bonus offered by VIKS.com are intended for genuine recreational players only. Abuse will not be tolerated. VIKS.com reserves the right to investigate, cancel, suspend or lock any account if abuse is suspected. At our discretion, all Bonus and subsequent gaming activity may be revoked and voided. If VIKS.com suspects that a player has committed bonus abuse, either on his own, or in association with partners, VIKS reserves the right to forfeit the bonus and void any winnings. 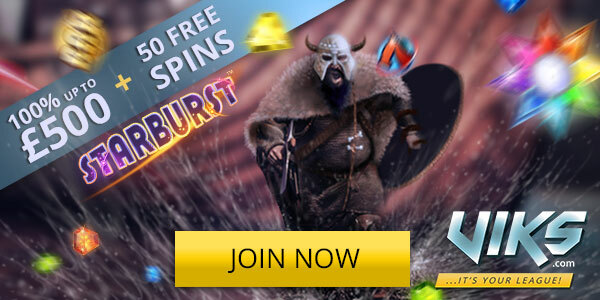 "20 No Deposit Free Spins on Starburst with VIKS Casino + £500 welcome package"